U.S. Department of Transportation Secretary Ray LaHood mounts a demonstration bike from the soon-to-be-named new bike-sharing program in D.C. Photo by Transportation for America. The U.S. Department of Transportation has hopped on the non-motorized bandwagon and is mobilizing the cycling and walking communities for the future of transportation policy. 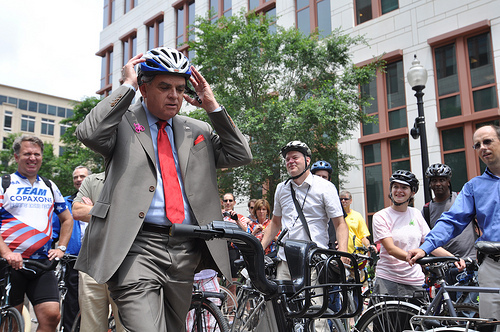 Transportation Secretary Ray LaHood test one of the bikes for the future bike-sharing program in the Washington, D.C.-area. With the U.S. Congress proposing $2 billion in emergency aid to help struggling transit systems across the nation, experts in public transportation debate whether mass transit really needs the extra boost or not. Well, it had to come to an end. Take a look back at Streetfilms’ video montage of the various activities happening around New York City during the month of May for National Bike Month. D.C.’s Smartbike system will be replaced by a completely new – still unnamed – program later this year. Vote for one of the current 17 choices or add your own! Will it be called “George” or “Stephen Colbert”? Today is the last day to vote. Often the bane of urbanists and municipal planners, culs-de-sac have a saving grace, according to Greater Greater Washington’s David Alpert. Culs-de-sac provide safe places for small children to play, however, as children grow, residential design must meet their needs as social boundaries extend. Along with millions of soccer fans and festivities, the World Cup in South Africa will have an environmental impact eight times greater than Germany 2006, despite the in installation of ecologically sound transportation and venues. Check out the new ad from Clif Bar and three bike-focused non-profits promoting biking and walking through the 2 Mile Challenge. Tents are still the principal dwelling in earthquake-ravaged Port-au-Prince, Haiti. Floods, landslides and disease threaten local residents, as hurricane season approaches, but for many, traffic poses the biggest threat. If you missed yesterday’s live chat with “Metropolitan Land Strategist” Christopher Leinberger, see the transcript of the conversation on urbanism approached by the private and public sectors. Ever heard of string rail? Gizmag takes a look at this low-cost, low-impact form of building high-speed transport that, potentially, could be faster and cheaper than conventional rail. Be sure to heed the warnings of Google’s and Bing’s walking directions (both are still in beta development) or you may be struck by a vehicle. Don’t know how to get where you are going? No matter what smartphone you have, there is a transit map application for it, in fact, hundreds. In this New York Times article, get the help in weeding out which app is best for you. Floating City for Haiti: Does it Hold Water?